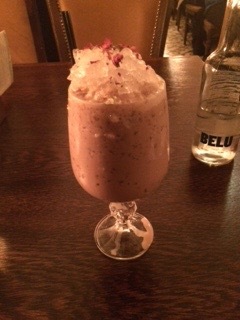 When I heard the name of the new cocktail being launched by The Trading House, London was 'A Dark Rose Choctail' I was expecting it to be sickly sweet- even from someone with a relentless sweet tooth. I'm happy to say that I was very pleasantly surprised. The cocktail had the perfect amount of sweetness without being overwhelming. It was milky, which made it a great comfort cocktail but the taste of rose was prominent enough to give it an edge. Overall it's a great alternative for Bailey's lovers. I'd definitely recommend heading to the Trading House for cocktail week. It's in the heart of the City of London and whilst it definitely had a Tuesday nigh buzz it was still spacious and the staff were friendly and attentive throughout. I think the cocktail would be great after one of dishes from the home comforts menu for a cosy evening.